For the past several days, many readers and friends have sent me two related items that they don’t seem to understand quite well. The first is the video of two pro-Israel White House press corps members who demand that White House/Obama spokesman Jake Carney tell them what the capital of Israel is. And he predictably squirms, refusing to answer. People insist to me that this is stark evidence that the anti-Israel Obama hates Israel. Well, I already know he’s anti-Israel. But that video is a joke. Where were these two apparently pro-Israel reporters for the first eight of the last 11.5 years, when President Bush wouldn’t recognize Jerusalem as Israel’s capital, refusing to move the U.S. Embassy there from Tel Aviv? Did they prefer not to embarrass President Bush and Dana Perino? Probably. ‘Cuz I guarantee you, they weren’t about to disappoint their Arab and Muslim friends and suddenly recognize Jerusalem as Israel’s capital, something he never ever did for eight years in office. In fact, people have a short memory. The Bush administration went to war against American Jews born in Jerusalem who wanted their passports and other American documents to reflect their birthplace (and/or place of death on a death certificate) as “Jerusalem, ISRAEL,” expunging that from passports issued at the U.S. Embassy in Tel Aviv. Bush fought this all the way up the Court system with Obama picking up the case when he took the White House and taking the case to the Supreme Court. If you said nothing about Bush policy on Israel for 8 years, you are a fraud and a hypocrite for focusing on Jake Carney’s statements now. And Romney won’t be any different. 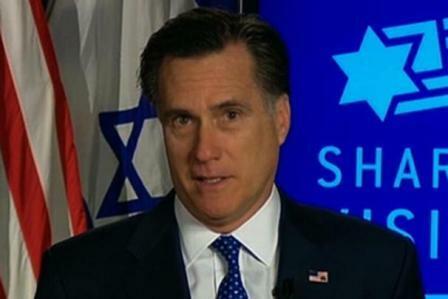 You think Romney’s position on Israel will be different? Only if you’re a gullible moron and believe his campaign speech in Jerusalem yesterday about Jerusalem being Israel’s capital and how the U.S. Embassy should be there. Hey, guess who else visited Israel when running for Prez and said they’d move the U.S. Embassy in Israel to Jerusalem? Both Bushes, Clinton (who even absurdly promised the “first kosher kitchen in the White House”–which no one asked for or needs), and Obama. And guess what? They all lied. Romney is no different. I’ll wait to see, if Romney reaches the White House, whether those same reporters will dare ask his spokesliar (probably Hezbollah supporter Dan Senor, who orchestrated Romney’s Israel visit, wrote his speech yesterday, and got rich off his partnership with Chris Heinz of the Heinz-Kerry-Tides-Foundation gang) the same question. I guarantee you Romney won’t recognize Jerusalem as Israel’s capital in the White House, and no one is moving the Embassy there any time in our lifetimes. Heck, when my former boss then-Congressman Phil Crane finally got his bill–to defund the State Department unless they moved the U.S. Embassy to Jerusalem–to the Floor of the House, AIPAC (the fraudulent “pro”-Israel lobby) was calling all of his colleagues, demanding they vote against it. And Romney is already backing down from his campaign people’s statements in Israel that he’d support Israel’s right to strike Iran. Instead, he told ABC News’ David Muir in a live interview that he supports sanctions and diplomacy. ‘Cuz, hey, Bush and Obama never tried those things for the last 11.5 years. And it’s working soooo gosh-darn well, ain’t it? Mitt Romney isn’t even President yet, and he’s doing enough Flip-Flopneys to make anyone actually paying attention dizzy. He flip-flop-flipped on his initially correct statement that the Brits weren’t ready for the Olympics. The next day, he said they are ready. And, in Israel, he told ABC News’ Muir that he stood by his original statement. This is a preview of the Obama-esque/Massachusetts Mitt 180s we’ll see plenty of in the White House. Watch the Carney video and tell me why you didn’t have a problem with this as Bush policy for 8 years, and whether you are actually dumb enough to believe Romney will finally reverse this decades-old obnoxious U.S. policy of not recognizing Jerusalem as Israel’s capital. If you think he will, I have some land to sell you. . . in Gazastan. And watch Romney’s flip-flop/backtrack on Iran, above. He’s also backtracking from his comments that Israel’s culture allowed the country to be more successful than the Palestinians, with aides now saying Romney “was misunderstood.” Oy, gevalt. Next, he’ll back track from comments that humans go to the bathroom. Just remember: neither Romney nor Obama will stop calling for a Palestinian State. Neither will stop attacking Jews for living where they want in Jerusalem and its suburbs, calling them “settlers.” Neither will get tougher on Iran. Neither will reverse the warm embrace of the Muslim Brotherhood or cancel CIA advisers to the Brotherhood rebels in Syria or billions in U.S. aid to the Brotherhood in Egypt. Neither will get tough on Islamic aliens with terrorist ties seeking entry and/or citizenship in the U.S. after having been here illegally. Either way, in terms of the Middle East, we’re screwed. And Muslims and their extreme goals are sitting pretty. Rest assured, no matter who wins the election in November, he will have a cornucopia of Arab Sheikhs lining up to finance and build his Presidential library and pay millions for speeches in retirement. Dr. Daniel Pipes seems to be a little more supportive of Romney than you. So if Romney doesn’t put the US on top of the Dome of the Rock he’s a fraud? What if the US recognizes Jerusalem as the capital of Israel and doesn’t move any buildings? Would that make you happy? Even if Mr.Romney chose Allen West as his running mate, he will not move the embassy to Jerusalem. Mr.Romney has a history of fabrications if you read any of the US news then research it on the internet. He pretty much says anything people want to hear or, things that are just out right fabrications. When he wanted to run for governor of MA he had been in Utah running the Olympics and had been there 2-2.5 yrs. MA has a constitution that says anyone running for governor has to have lived in the state for 7 consecutive years. Mr Romney paid taxes in Utah claiming his address there because taxes are less than MA. When is residency came up as an issue he said he was going to file taxes in MA retroactively showing residence there. Whether he actually did or, not, no one really knows because, much like now, he refused to show is income tax returns. Here is a link from an ex-Mormon that will give you an idea about his religion. He was a bishop with the LDS Church. The church comes first, family second. If the church calls to request ANYTHING they are obligated to do it, no matter what.The Mormon Church is one of the wealthiest organizations in the world, vying with the Catholic Church for #1. No one knows the exact amt because neither releases their financial information. The Mormon Church is how much younger than the Catholic Church? Read this short article and then form your own opinion.